1) .915 – This is the save percentage that Islanders’ goaltending needs to achieve. After looking at the stats from the last two years, the league average is somewhere between .915 – .920. Over his last two seasons with the Islanders, starter Evgeni Nabokov has posted a save percentage of .914 and .910 respectively. It is no secret that the team’s biggest weakness will be between the pipes this season. Evgeni Nabokov is another year older, and backups Kevin Poulin & Anders Nilsson are another year unproven. How the Isles delegate the work load throughout the season will be one of the most interesting points to monitor. With 18 back to back games this year, Poulin/Nilsson will have plenty of opportunities to prove they belong in this league. If not, GM Garth Snow will have to make a move by early next year. Although not quite a “contender” yet, this is the closest the Isles have come to a “win now” team in a long time, and it would be unfair to core players like John Tavares, Matt Moulson, & Kyle Okposo to have another playoff experience squandered over the steadiness in net. Asking for your goaltending to be around the league average is not asking for the stars. The guys in the crease need to pull their weight. 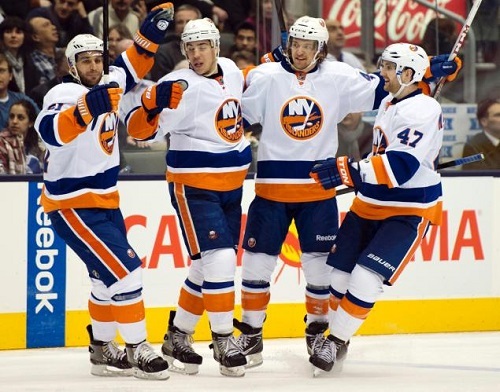 2) Secondary scoring – Quite simply, Kyle Okposo & Josh Bailey have to continue to progress. A major reason for the run towards the post season last year was the production of these two wingers. You know what you’re going to get with first liners Tavares & Moulson, and I suspect new Islander Pierre- Marc Bouchard to put up numbers similar to what Brad Boyes did last year. Players like Michael Grabner & Frans Nielson should also help out with secondary scoring, but for the Isles to be a playoff team, Okposo and Bailey have to eclipse the 50 point mark. This has been done only once during both of their careers (Okposo in 09-10). Whether both are on the second line, or Bailey is moved up to the first (which happened at the end of last season), both players have the ability and talent to help out more consistently in the scoring department. 3) Are these kids legit? The Isles boast one of the deepest prospect rosters in the league, and 2013-14 could be the year that Garth Snow’s draft and development plan comes to fruition. Through two weeks of training camp, defensemen Matt Donovan & Griffin Reinhardt, along with forwards Brock Nelson & Ryan Strome have put themselves in prime position to make a contribution this season. On opening night, Matt Donovan has the best chance to make the most noticeable impression, taking over for the departed Mark Streit on the blue line. As impressive as Griffin Reinhardt has been throughout camp, it’s hard to imagine the Islanders’ keeping him with the big club any longer than an 8 game NHL tryout. If this is the case, he will be sent back to juniors. Up front, Brock Nelson has showed little, to no weaknesses, that should land him an opening night spot either on the wing or at center. Ryan Strome, who has the most “star” potential, may be given a shot following the recent injury to Cal Clutterbuck, but based on the latest lines in camp, he has fallen behind Nelson for a roster spot. There has been a lot of talk about the Islanders’ young talent coming up the pipeline. No matter how things shake out on opening night, the time has finally come to see if all the talk has been worthwhile. 5 Keys to Isles Season. 4) Quick start – The Islanders have to take advantage of an easy October. They play 8 of their first 12 at home, and with games against teams such as Phoenix, Buffalo, Edmonton, & Carolina, the points are there for the taking. Islander teams of recent memory have been prone to long droughts throughout the season. On top of this, the team had a dismal 10-11-3 record at the Coliseum last season. To be successful in 13-14, the team needs to play at better than a point per game pace during the first month of the season. 5) Dearly departed? This probably will not have any direct impact on how the 2013-14 New York Islanders fare, but I’d be lying if I said I won’t be monitoring the play of former Islanders’ Mark Streit & Nino Niederreiter. Maybe it’s just my Islanders’ pessimism kicking in, or I’m simply being to “yingy-yangy,” but for some reason, I can’t kick the feeling that the play of these two will somehow offset the performance of the Isles. The loss of Streit was understandable. He wasn’t worth what he was asking, and we all were waiting for JT to get the “C,” but Streit is still considered a power play specialist whose departure more than likely will have a negative impact on the Islanders. Niederreiter, who was traded to Minnesota in the offseason for Cal Clutterbuck, could be plugged into the Wild opening night lineup. The Wild staff has been impressed with his play, and a top 6 spot isn’t out of the question. Nino has the potential to post 60-70 points this year, and I’m sure I won’t be the only one with a bitter taste in his mouth if this is the case, and all we have to show for it is a bottom six forward that throws himself into the boards a few times a night. If the Islanders can be in the ballpark with the questions above, there’s a good chance they reach the postseason for the second straight year, with possible improvement on last year’s 8th seed. These goals are more than reachable. Get average goaltending, get average scoring from your second line, have first round draft picks play like first round draft picks, and play better than .500 at home. I don’t think that’s too much to ask.